The protagonist in 'Mid90s' is a young skateboarder ... just like he was. LOS ANGELES — The first time Jonah Hill’s mom dropped him off at the West L.A. Courthouse, she didn’t want him to get out of the car. He’d told her this was his favorite place to skateboard – the spot where he and his buddies had been hanging after school. But seeing it in person – a dingy concrete courtyard populated by homeless people and flanked by a bail bonds shop – she thought it was too seedy for her 10-year-old son. But he couldn’t just stop going. As a preteen, Hill was desperate to find his tribe, and he’d recently fallen in with a group of skaters who hung out at the Hot Rod shop on Westwood Boulevard. He idolized them – these kids in their baggy jeans and beanies who seemed to flow through life, tackling every risk with rebellious spirit. He was sitting on the steps of his childhood haunt last week, watching the sole skater at the park attempt some low-key tricks. Hill brought his laptop to these steps to write “Mid90s,” his directorial debut, many times over the past few years. Though Hill insists the movie is not autobiographical, it contains numerous parallels to his youth: The protagonist, Stevie (Sunny Suljic), is a 13-year-old living in 1990s Los Angeles who finds refuge from his troubled home with a bunch of unruly teens at a local skate shop. 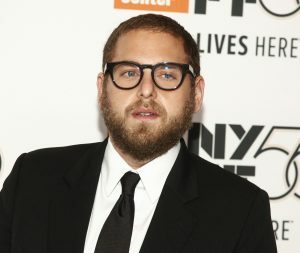 Jonah Hill at the premiere of “Mid90s” at the New York Film Festival earlier this month. Hill knows what it’s like to take a hit. He got famous in his early 20s as the star of 2007’s “Superbad” and was quickly branded as Hollywood’s go-to goofy, chubby comedian. Even though he’s flashed some serious dramatic chops in the past decade – earning Oscar nominations for his roles in Bennett Miller’s “Moneyball” and Martin Scorsese’s “The Wolf of Wall Street” – he said he has still felt an expectation from the public to be funny. He also channeled his experience with Scorsese on set. While working with his actors – most of whom were under 21 – Hill tried to be casual with his directing guidance. Before an emotional scene, he’d ask an actor to take a walk with him and would tell the kid a story that indirectly related to the material. Hill rises to walk around the perimeter of the park.